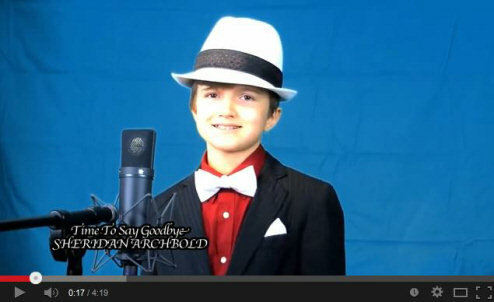 Sheridan Archbold is a 12 year old crossover Opera singer from Chicago Il. He has become known for his singing of patriotic songs and can sing in 6 different languages. He opes each act with a comedic style to capture his audience and then performs flawlessly. Discovery of new young talent is always the objective of this site, but rarely are we so fortunate to find a talent like twelve year old Sheridan Archbold. While nearly every genre and style of music has been showcased here, one genre has been sorely neglected. Of course I’m speaking of Classical music and Opera. Not because we don’t recognize the importance and beauty of this style of music, but because finding a youngster who can do it justice is not a simple task. While I’m not certain he’s the youngest, he certainly is one of if not the most talented I have ever heard. The clarity of his vocals, his perfect pitch and tone, and his use of vocal techniques beyond his years has earned him the right to be respected as a true professional performer. In fact Sheridan has a most impressive resume for a young man his age! I think what caught my eye watching him for the first time was his short comedic openings that he has for every music video he creates. It’s in these short openers that you can catch a glimpse of this young man’s personality and the tool he uses to connect with his viewing audience. 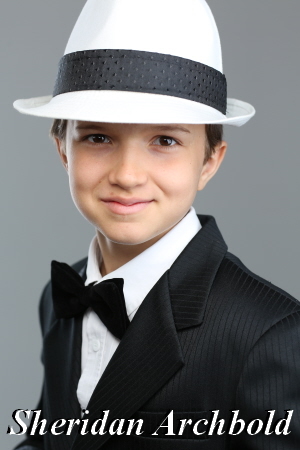 You can also see his Live Standing Ovation Performance of this song where he was named the Grand Award Winner for the 2013 Mid-South Junior Youth Talent Contest. After recently making contact with Sheridan’s parents through Facebook I found to my delight that Sheridan was willing to share his story with me for today’s publication. I asked him a variety of questions which he answered by providing the following…………………. “We have lived in Illinois, Missouri, Indiana and Australia. We now live in Yorkville, a small town in Illinois.